Like the last pre-election Forum in 2008 this was held on the hottest weekend of the year, but there the similarities ceased, and not just with the move from Warwick University to Milton Keynes. For the most part constructive dialogue and willingness to compromise outweighed arm- twisting, and all sections of the movement could co-operate instead of being played off against each other. The Chair Angela Eagle opened by invoking the spirit of 1945 and Labour’s manifesto “Let us Face the Future”, committed to decent housing, jobs for all, and an end to want and poverty. Now, with a million people dependent on foodbanks, the most vulnerable hit hardest by the Tories and the NHS under threat, we had to translate our timeless values into today’s political situation. Money would be short after the general election, but social justice could be achieved by big reforms rather than big spending. Shadow chancellor Ed Balls said that people were relying on Labour to tackle NHS waiting times and zero-hours contracts, and to get the deficit down in a fair way while delivering real change and rising living standards. Labour would build homes, reform the energy market, introduce technical degrees, repeat the bank bonus tax, restore the 50% tax rate on income above £150,000, raise the minimum wage faster than inflation, and promote the living wage. Members asked about public sector pay, inheritance tax, payday lenders, Europe, and the Scottish referendum. Ed Balls hoped that 300 years of working together in the United Kingdom would continue, and feared that Nissan, Toyota and other international companies would pull out if we withdrew from Europe. He said that Labour had to show fiscal responsibility, but disagreed with George Osborne’s unfair attitude towards public service workers. He would introduce a mansion tax for properties worth more than £2 million and bring back the 10% tax band, helping everyone who earned over £10,000. Party leader Ed Miliband addressed the Forum on the following day. He expressed deep concern about the plane shot down over Ukraine and the escalating violence in Gaza, as well as the continuing war in Syria. He reinforced Ed Balls’ economic messages and emphasised fair pay, both at the top and the bottom; rising inequality should not be a fact of life, and it was wrong that one in five people in work were still below the poverty line. Labour would enforce the minimum wage, deal with exploitation, scrap the bedroom tax and give private tenants more protection. He paid tribute to councillors and to party members and promised to build a country that works for everyone. Ed Miliband strongly endorsed the Better Together campaign. With 16- year-olds voting on Scotland’s future, there was now momentum behind allowing them to take part in all UK elections. He noted predictions of an 80% turnout for the referendum, and hoped to convince people that their vote in the general election mattered just as much. On climate change and biodiversity he stressed the economic case for green jobs, but above that, climate change was the ultimate challenge to short-termism. Before entering detailed negotiations there were group discussions of areas which had attracted most amendments: housing, the NHS, defence, public transport, schools, and low pay. Tristram Hunt led the education session, which focused on David Blunkett’s proposals for directors of school standards (DSS), appointed by local authorities and working with councils and the community, to provide a “middle tier” between schools and the secretary of state. He said that nearly 30% of children were enrolled in free schools and academies, and simply returning to the old local education authorities was not an option. However questions were asked about how the new DSSs would be held to account. I also attended the session on Trident where, in the spirit of glasnost, Jeremy Corbyn was invited to put the case against renewal. He was outnumbered, though not outgunned, by Malcolm Chalmers from the Royal United Services Institute and spokesmen from Unite and the GMB. Malcolm Chalmers said that if Britain did not already have nuclear weapons we would not acquire them. They would only be relevant if there was a nuclear threat to the UK, if the United States was not on our side, and if their use was morally justified, a combination of circumstances which he described as very very unlikely. This really answered Jeremy Corbyn’s question: what credible threat would be deterred by nuclear weapons? The unions focused on protecting defence jobs in Barrow, Faslane and elsewhere, though their estimated numbers were many times those of the frontbench. Maintaining a highly-skilled workforce required making nuclear submarines continuously and indefinitely, with a steady drumbeat of design and production, regardless of cost or purpose. A lively but good-tempered discussion followed. First, police and crime commissioners. I’d proposed abolishing PCCs and restoring local democratic governance. The frontbench were still consulting on the recommendations of the Stevens review of policing, and so I and others agreed to await assessment of what reforms might be needed. Second, tuition fees. The frontbench accepted my growing alarm at the financial unsustainability of the Tory/LibDem system. Current predictions showed that nearly half the money lent to students would never be repaid because they would not earn enough, blowing a multi- million pound hole in the higher education budget. Government policies, including restrictions on student visas, were also damaging part-time and postgraduate student numbers. We were promised an announcement later this year when costed plans have been worked out. Third, universal credit. The incoming Labour government would conduct a full review, and problems with principles and practicalities were acknowledged, including its interaction with up to 26 “passported” benefits linked to out-of-work support. So far universal credit had been rolled out only to young single people with no dependants, the most straightforward group. Labour would switch payment of child-related elements from the main earner to the main carer, and ensure that work would pay for both the first and second earners in a couple, though some doubted if this could be done within the overall budget. The option of scrapping universal credit entirely was implicit in the agreed wording. Fourth, pensioners. As I expected, I failed to get winter fuel allowance added to the state pension and taxed, instead of means-tested. There was more success on protecting pensioners who are no longer required to buy an annuity and might run out of cash. Labour was pressing for a full risk assessment to ensure that there were no unintended consequences for individuals or public finances. The agreed wording included support for the single-tier state pension, while continuing the minimum income guarantee for those already retired or without sufficient qualifying years. Labour would also explore how to reduce the threshold for auto-enrolment in pension schemes from £10,000 to the national insurance lower earnings limit, currently £5,772. I am not sure about this: the amounts saved may be too low to provide a decent top-up for the state pension, and could come as a shock to people who believe that they are providing for their old age. In addition, tax relief would be restricted for the very highest earners, which I think means cutting it to 20% for those in the 50% band. Fifth, enhancing democracy. Most of my suggestions did not survive. The final wording said that Labour would pilot secure systems for electronic voting and electoral registration on polling day, and consider piloting elections on days other than Thursday. Proportional representation for local government, job-sharing for councillors and MPs, compulsory voting, and allowing British citizens living abroad to continue voting indefinitely all attracted little support, and disappeared. This pre-empted the outcome of the 2015 review and presumed that Britain would retain nuclear weapons, with only delivery methods up for discussion. We could not get it removed. but this reflects current, not necessarily future, policy. It can be changed. Meanwhile discussions elsewhere reached consensus on disability rights, taking competition out of the NHS, tribunal fees, legal aid, zero- hours and short-hours contracts, agency workers, immigration, local government funding, housing, the Middle East, the minimum wage, the living wage, Royal Mail, the railways, science and technology, mental health, fracking, animal welfare, Lords reform, reducing smoking and consumption of alcohol, fats and sugar, reaffirming all-women shortlists, youth services, careers advice, sexual and relationship education, and even the 11-plus (recognising that selection at age 11 damaged education for all children, but stopping short of abolishing existing grammar schools). By Sunday morning almost everything had been resolved. Partly this resulted from advance work, particularly with the unions, and while some tabled wording showed signs of having been agreed before the Forum started, this seemed more sensible than starting at square one with only 48 hours to get to a conclusion. And partly from a willingness to meet halfway from both sides, including the shadow ministerial teams, for which Angela Eagle, and also Ed Miliband as leader, deserve credit. Most similar amendments had been withdrawn in favour of wording which said that Labour would take a different approach from the current government, setting out policies for jobs and growth, tackling wealth and income inequality, driving up wages, and maintaining the universal principle in a social security system which worked to end poverty. Changes to the 2015/16 spending plans would be fully costed and set out in the manifesto. Unsurprisingly the amendment was lost by 14 votes in favour to 125 against. So it was a rewarding weekend compared with past unpleasantnesses, and hopefully the outcome will inspire activists, supporters and voters. But while constituency representatives made real efforts to take forward amendments from local parties the Forum is still, unlike annual conference, a closed process, and the wider membership has to judge whether they have been sufficiently heard. Questions and comments are welcome, and I am happy for this to be circulated to members as a personal account, not an official record. Reports of meetings from July 2008 onwards are here, with earlier reports at www.annblack.com. Whatever happened to the parliamentary Labour party? Deja vu? Or, am I seeing things again? Are you sure it wasn’t the spirit of 1997? From what I can make out the NPF seems to have shown the sort of compliance with manipulation, pressure, and a bit of glad-handing, that Michael Meacher criticises in the PLP. Ed Miliband “emphasised fair pay, both at the top and the bottom”. But what on earth does that mean? He said that “rising inequality should not be a fact of life”. Surely the point is to reduce inequality! He “promised to build a country that works for everyone”. Is that possible? Is something that works for the NHS getting medicines at reasonable prices and with honest information the same thing that works for the drug companies? The failure to recognise mutually exclusive interests in society means that Labour ends up pretending to be an independent arbiter between interests without identifying with any. Even that is an overstatement since we hear Labour described as “the Party of business” but not as “the Party of the working class”. The education discussion “focused on David Blunkett’s proposals for directors of school standards (DSS), appointed by local authorities and working with councils and the community, to provide a “middle tier” between schools and the secretary of state”. This proposal came out after the draft statement which makes no reference to it. Many submissions will have been made without seeing it. Besides it is directly contrary to the most frequent demand of the submissions that education should return to the local authority framework. That view was simply swept aside with the trite “simply returning to the old local education authorities was not an option”. Who says it is not an option? David Blunkett and Tristram Hunt. Have they presented a case? No. Have they dealt with the arguments for local authority frameworks? No. And that, it seems is how policy is made at the NPF. Only two submissions show any inclination to accept Blunkett’s DSSs. Over forty called for a return to a local authority framework. Was that reflected in the final “consensus wording”. Not at all. Many submissions called for to end the 11+ exam and to stop supporting selective schools the Forum ended up with no commitment at all but just a vague statement saying that selection is not a good thing. Tristram Hunt argued that Labour couldn’t afford to oppose the 11+ because it might forfeit marginal constituencies in Kent on that basis! Delegates seem prepared to be convinced by that sort of nonsense. No principle, assumed public opinion, no effort to take the arguments for change to form public opinion, no examination of the facts of the matter. On enhancing democracy “The final wording said that Labour would pilot secure systems for electronic voting and electoral registration on polling day, and consider piloting elections on days other than Thursday”. I suggest that it might help democracy if Labour took it seriously within the Labour Party. I was, however, pleased to see PR for local government considered. Anything to start the break up of our ridiculous FPTP system. I wonder if this proposal will go into the manifesto. The organisation of the weekend also seems highly questionable. Most of the time was spent in groups discussing the separate policy areas. Only if a consensus wording was not agreed would a wording go back to the plenary for debate. That only happened for one issue. 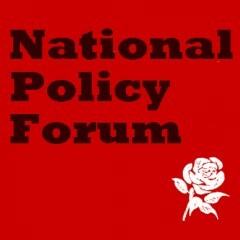 So for the rest the NPF agreed to a bunch of policy statements which the majority of them had never seen. Where there was clarity in the submissions the Forum ended up with vague statements of “principle” and “Labour will look into” statements. It all sounds like a democratic dog’s dinner to me. I wish I could see what Ann finds “inspiring” in all this. I also got a bit annoyed with ‘ Labour will look into… etc things’ phrase. The Coop Party has come up with some pragmatic solutions for Rail Energy Housing Education Civil Society.. etc and all that we’re being palmed off with is Labour will look into etc… this . You couldn’t make it up. 9 months before a crucial election we still need policies and pledges. Labour the party of the middle class hard working. Labour is not the party of 1945, because they were commies, labour is the party of the NHS once Tesco buys it and runs it or ATOS. Lets be honest Miliband and Ball’s would have issues running a p*ss up in a Brewery if the beer sorry wine was free. How thge F*ck can you evoke the Labour party ethos of 1945 when today your state that we are not old labour or New labour but Disrarali a blood Tory. Or One Nation Progress party of the middle class rich well off. Miliband would not know poverty if it hit smack in the face. Miliband and his hard working party of the well off middle class pratts.